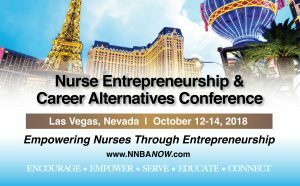 Join your colleagues from all over the country as Nurse Entrepreneurs, Aspiring Nurse Entrepreneurs, Self-Employed Nurses, and Nurses in Business will be meeting the weekend of October 12 – 14, 2018 in Las Vegas, Nevada. This conference is designed for those nurses that are thinking about starting a business, those already in business, those looking for career alternatives and additional income opportunities. Nationally acclaimed speakers, business experts and nurse business leaders will provide nurses with the information, tools and actionable take-a -ways to start your business or make your current business even more successful. In addition, there are seven preconference workshops that will give you detailed how-tos, resources and tips, whether you are a novice or a veteran business owner. This is an educational and professional development event with eligible contact hours.